Good evening! I hope everyone is having the most splendid holiday season! 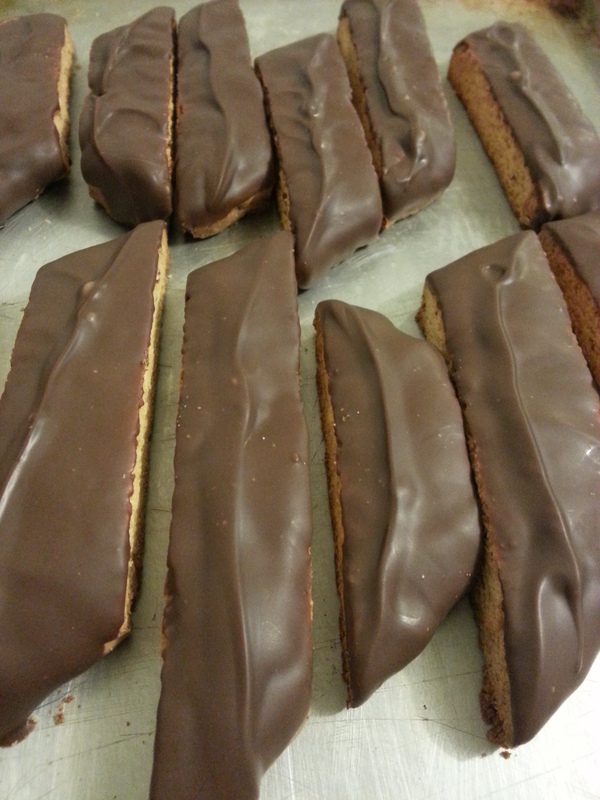 I love making biscotti around this time of year. It’s so good to dip into your hot chocolate, coffee, hot tea, or even just plain milk! I made three different types of biscotti to give as gifts to some coworkers. 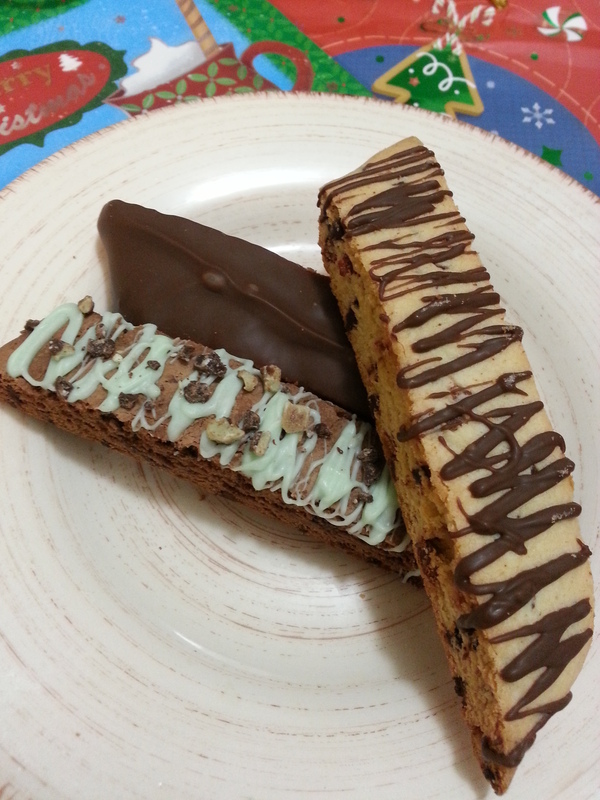 I made a traditional almond biscotti covered in chocolated, a double chocolate mint with green white chocolate drizzle, and a chocolate chip bacon with chocolate drizzle. 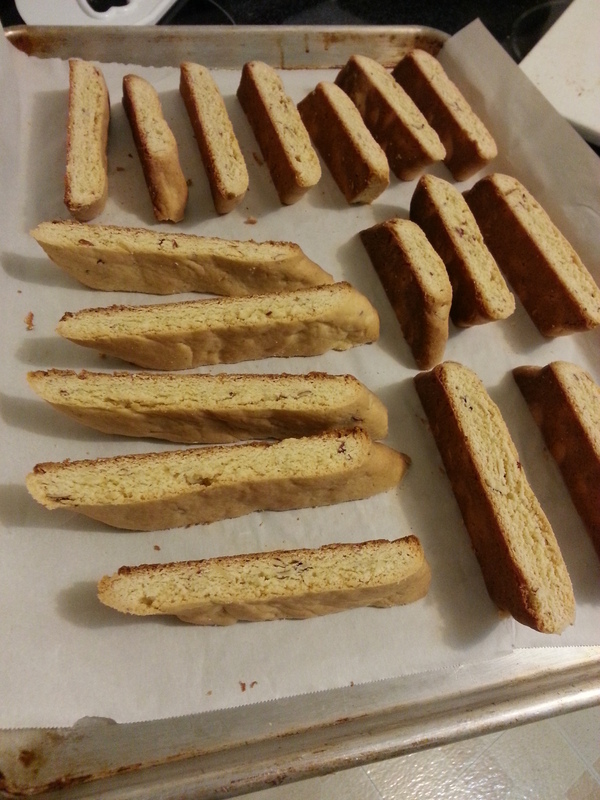 I used the same base with all three biscotti. It really is simple to make these. Cream the sugar and butter together until fluffy, add the eggs one at a time along, and then add the extract. Scrape your bowl if needed to make sure everything is smoothly mixed and incorporated. 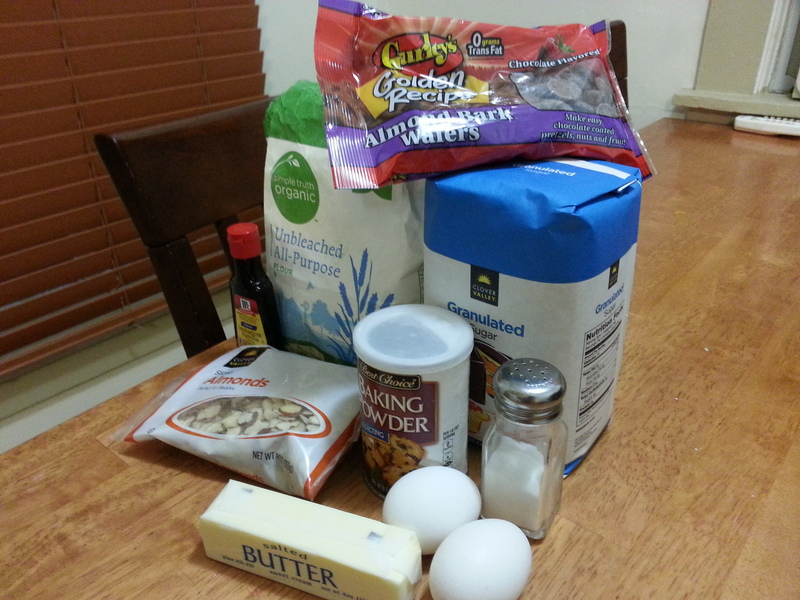 Whisk the flour, baking powder and salt together in a separate bowl. Add it gradually to the creamed mixture and mix just until a dough forms and pulls away from the sides of the bowl. Turn the dough out onto a lightly floured work surface and rub your hands with a little flour. Divide the dough in two and form each half into a log about 4 inches wide by 10 inches long. Bake on parchment lined baking sheets until lightly browned and small cracks form on top, about 25 minutes. Remove from oven and cool slightly on the baking sheets. Transfer the logs to a cutting board. Slice on the diagonal in generous 1/2 inch slices – this is easiest by using a straight down chopping motion with a good santuko or chef’s knife. Place them with the cut side up on parchment lined baking trays and bake another approximately 16-20 minutes or until slightly browned, turning over half way through the baking. Cool completely on a wire rack. For the Almond Biscotti, use the base recipe and just add about a half cup or more of slivered almonds to the batter after you mixed everything together. 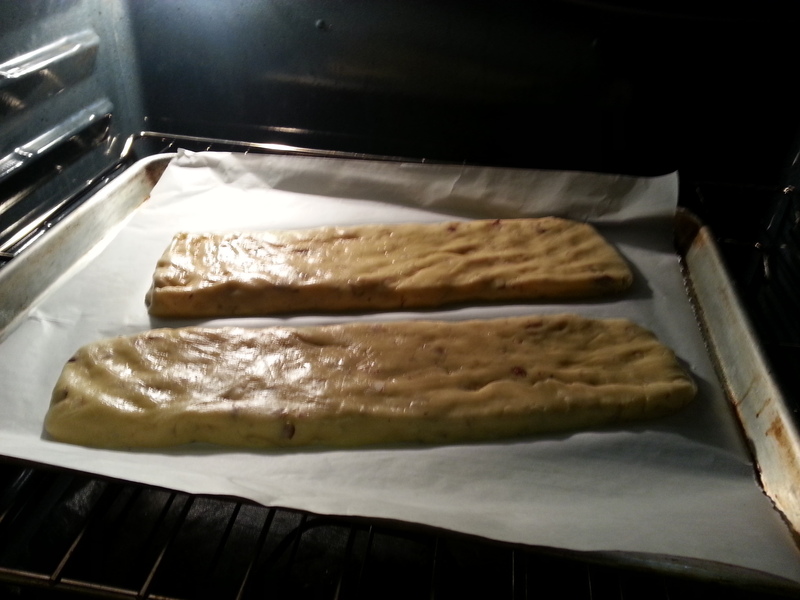 After you are done baking the biscotti, let it cool COMPLETELY. Now you can heat up your almond bark and start dipping your biscotti. It does get messy, so you may want to use parchment paper to do this. 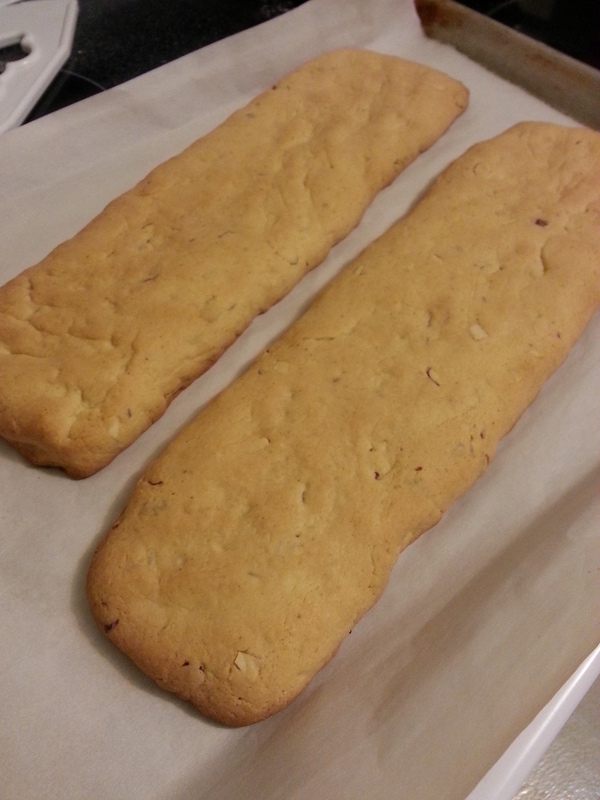 The almond bark dries pretty quickly on its own once it is on the biscotti, but I put it in the freezer to set it a bit more. 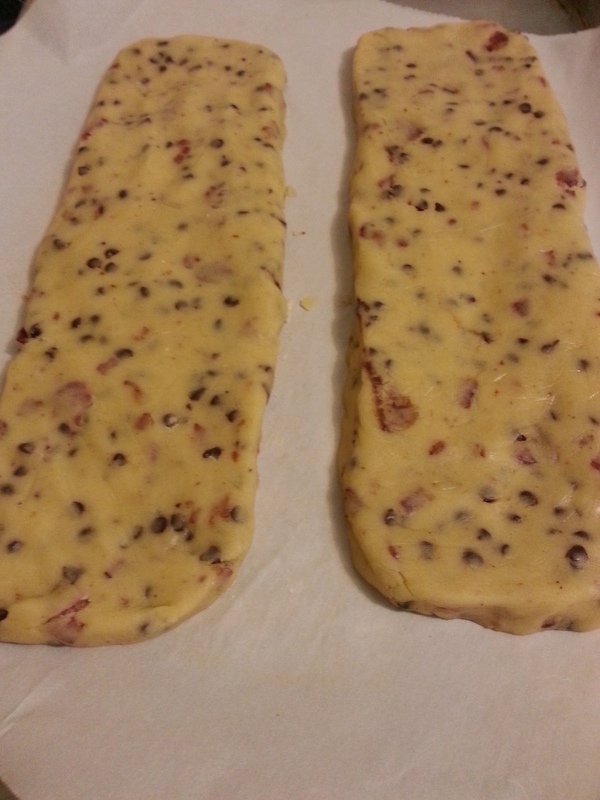 For the Chocolate Chip Bacon Biscotti, you need to cook your bacon first. I used 6 pieces of regular cut bacon. Use whatever you would like. Make sure it is in small pieces, and crisp it up good. Let it cool. I used about half a cup or a bit more of mini chocolate chips. 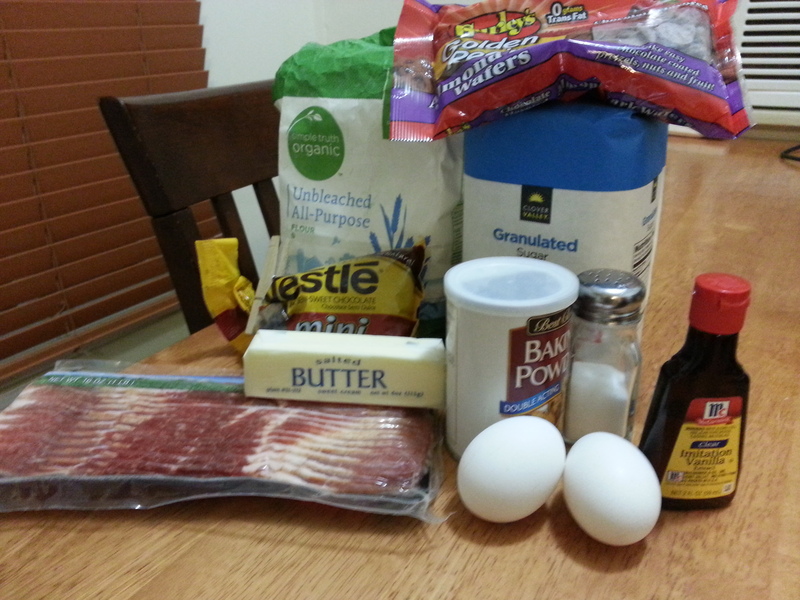 Use the base recipe and add the bacon and chocolate chips after you have your other ingredients combined. Again, let them cool before decorating it. For the chocolate drizzle, I used chocolate almond bark, dipped my fork in it, and then just did a back and forth motion over the biscotti. When you’re done, put them in the freezer to set up quicker. 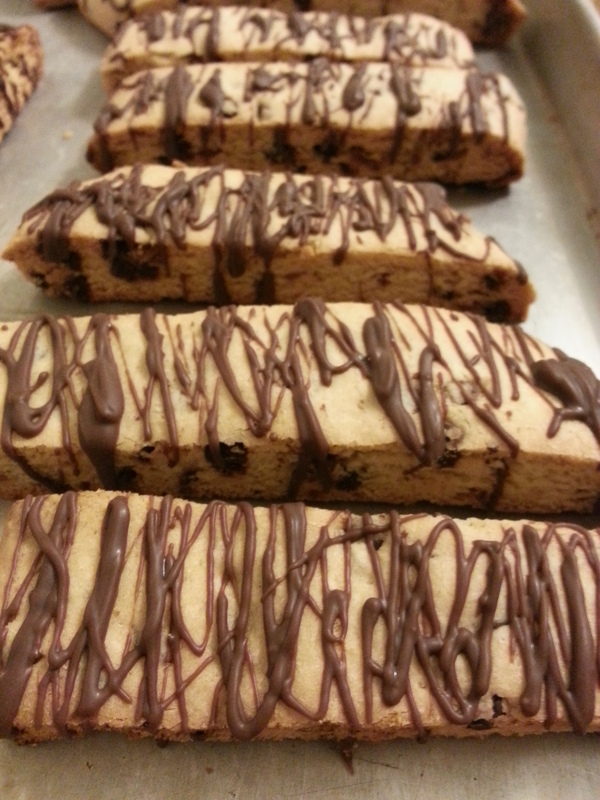 The last type of biscotti is the Double Chocolate Mint Biscotti. 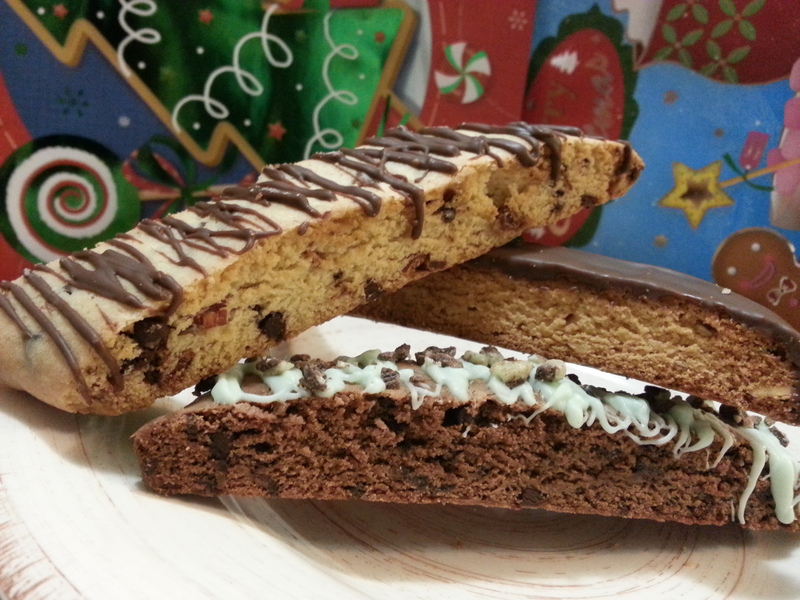 This biscotti tastes just like a Thin Mint. Use the base biscotti recipe, but add about 1/4 cocoa powder (or a bit more if you would like) to the the dry ingredients. 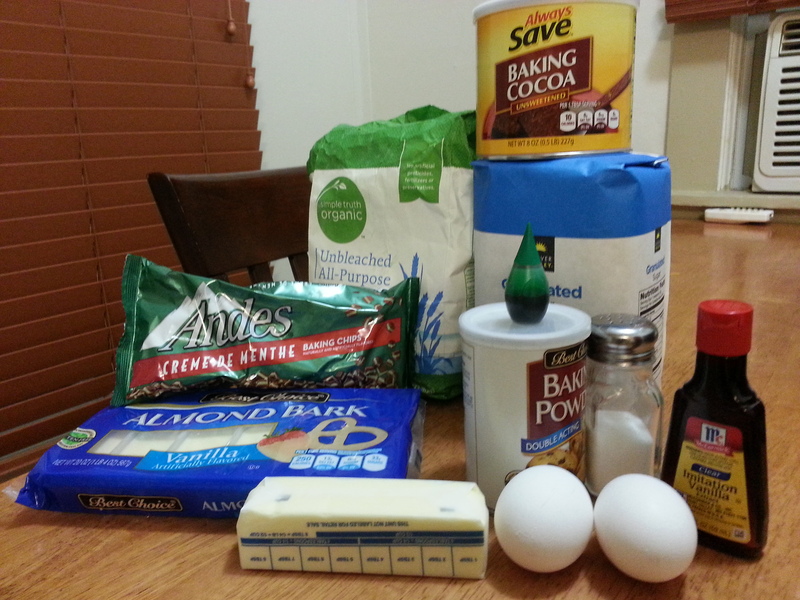 After all ingredients are mixed together, I added a cup or so of chopped Andes mints and 3/4 cup of mini chocolate chips. Let them cool before decorating it. 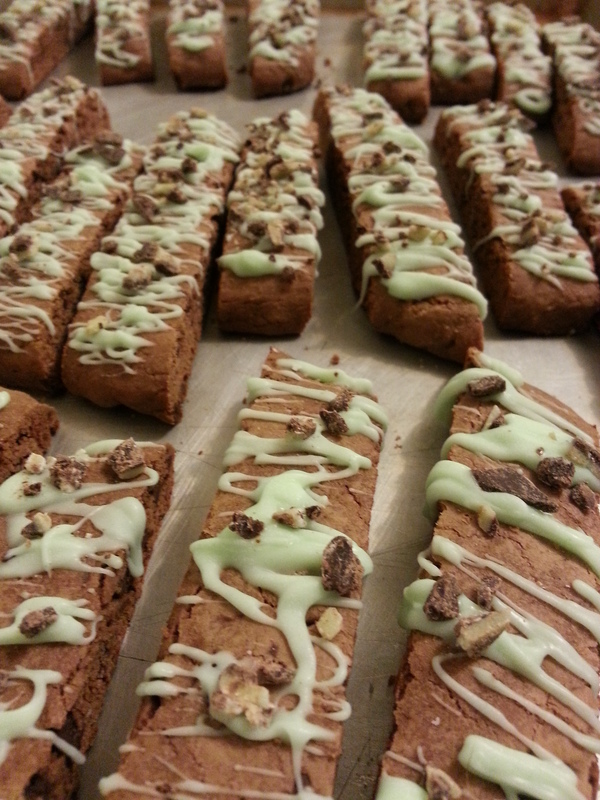 For the drizzle, I used white chocolate almond bark and added green food coloring, dipped my fork in it, and then just did a back and forth motion over the biscotti. After each one I decorated, I put a few pieces of the Andes pieces on top before it set. When you’re done, put them in the freezer to set up quicker. There you go! If you make all three of these in one night, it does take many hours. At least for me it did. Other wise, if you only do one, it shouldn’t take very long to make! These hold up really well in the freezer, so don’t be afraid to make a bunch! 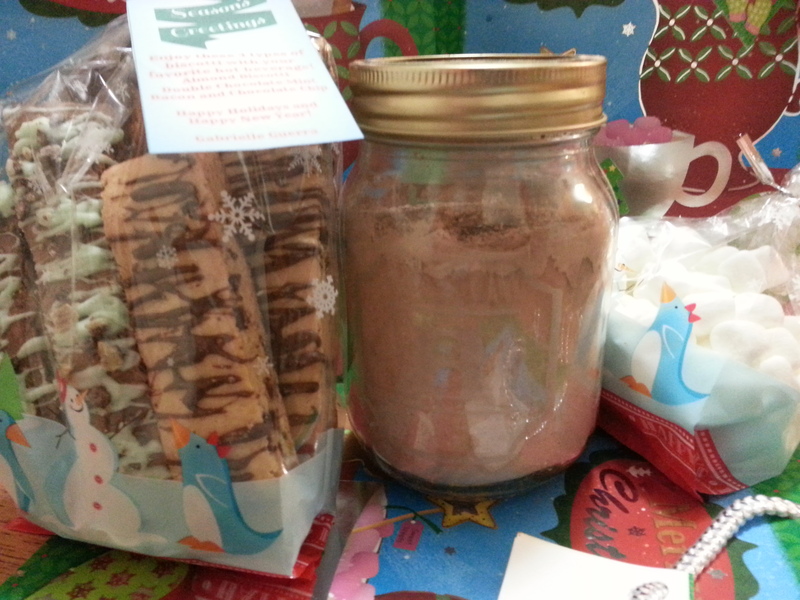 Put them in a bag, add some hot cocoa mix, and you have a super cute gift! Maybe Santa would like these instead of traditional cookies! 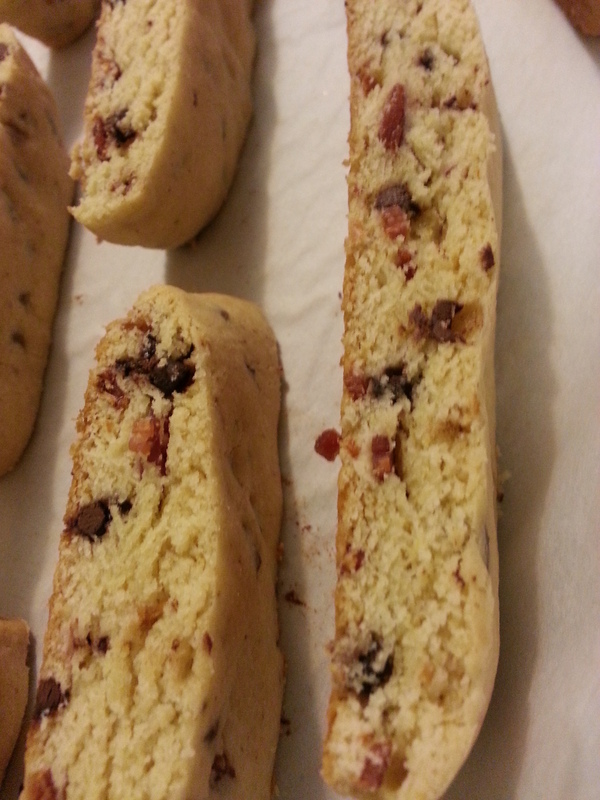 This entry was posted in Food and tagged almond biscotti, bacon, bacon biscotti, baking, biscotti, biscotti recipe, biscotti three ways, chocolate, chocolate biscotti, cookie recipe, cookies, cooking, dessert, diy, easy recipe, food, home made biscotti, homemade biscotti, mint biscotti, nood mood, recipe. Bookmark the permalink.